So I talk about our grandson, well finally I can insert pictures so, here he is. 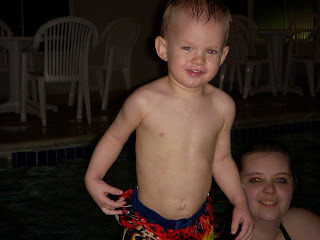 This is Feb. of 2008, 3 months short of him being 2 years old. He is a tall boy, already 35 inches. This is at the pool where we stayed. His Godmother, Deanna is behind him. (I apologize for the red eye) As time goes on we'll have more pictures posted. So a little about Mr. Braeden. He is very smart. He already can count to 15 by himself, and is now learning to say his numbers in Spanish He can also say his ABC's. Here is another picture of David & Braeden, We were in NY. They were both worn out when they got done. 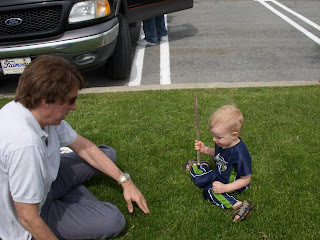 But they had fun, Braeden now loves chain link fences, so he can run a stick across them. Ahh the innocence of youth. They remind us of this each time you see their eyes light up at the sight of a butterfly, or the taste of something new. Or when they look into your eyes and say "I'm sorry" for something they really didn't do wrong. Enjoy them when they are little because time just keep marching on and they grow up quickly as we all do. So until next time, Enjoy.